Today marks six months since I arrived in China. In some ways, it seems like a short time. Work keeps me very busy, and so the days go by quickly. In other ways, it seems like a long time. I have learned a lot, and done a lot so far, but I miss my family very much. In the future, when I look back on this time, I hope I will not regret the price that I forced my family to pay by choosing this career path. There are always regrets, of course, and you can never be completely sure that you’re doing the right thing. Maybe all you can to is try not to second-guess yourself, and look to the future. 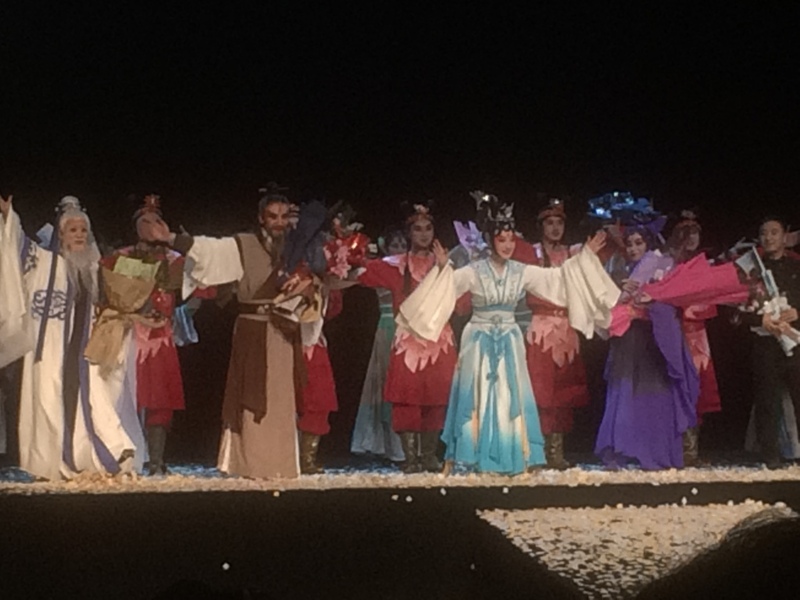 The Consulate’s Public Affairs Section was given some tickets to a Chinese opera, and I was able to snag a ticket. 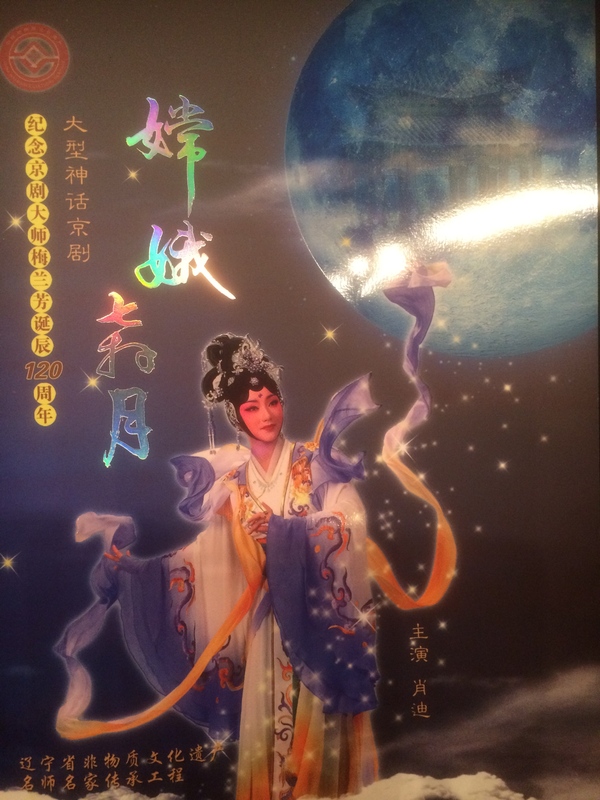 The show was based on the folk story of the woman who flew to the moon, 嫦娥奔月. The libretto captured the whole story of Hou Yi the archer who shot down 9 suns, and the pill of immortality that his wife Chang-E stole from him. The story was enhanced to include foreshadowing and depth of plot. In the end, it’s a tragedy, as the two lovers are separated by mortality and space. The performance was a commemoration of the 120th anniversary of the show, which was performed by a legendary male performer who gained fame by performing women’s roles. The show is also recognized by UNESCO as a cultural heritage. That’s marked by the red banner over the stage. During the performance, the spoken and sung lines of the show were displayed on screens on either side of the stage. This was an enormous help to me. The last opera performance that I saw was in 1988 in Taipei. My Chinese has improved a lot since then. This time, instead of not understanding any of the language, I only didn’t understand 90% of it. The captions were a lot of help. 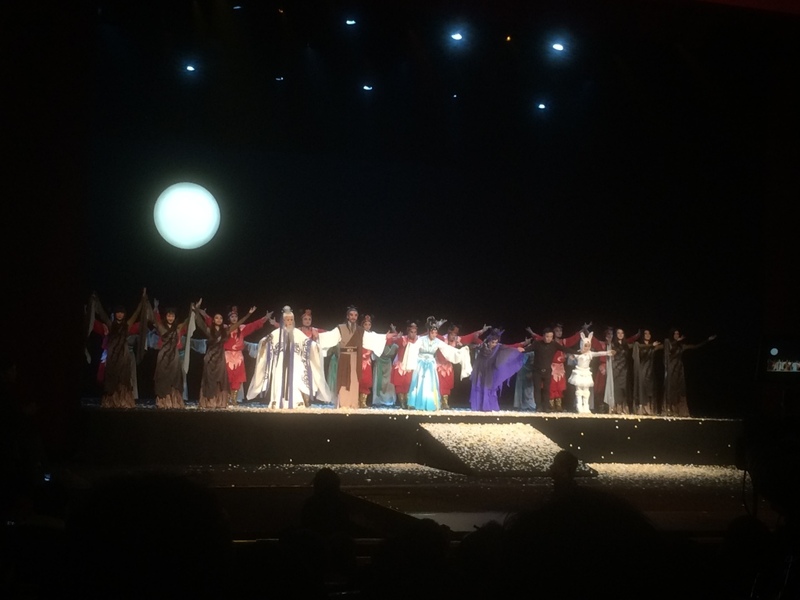 The show seemed to be more modern; there were spoken parts in addition to the singing. In addition to the traditional acrobatics, there were some special effects, like clouds and snow. The final scene, showing Chang-E in her ice palace on the moon, with snow falling, was visually stunning. The lasers were over the top, but this is modern China, after all, so you have to allow for some tackiness. 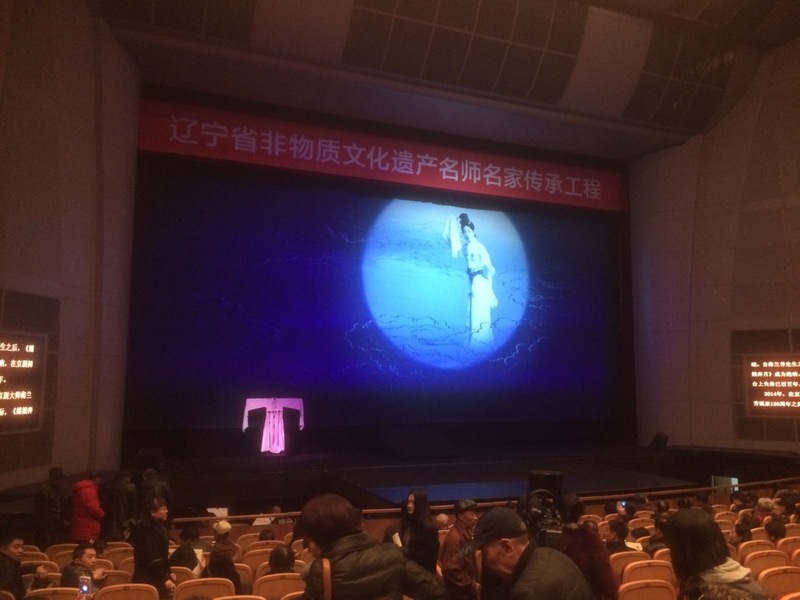 My first Chinese opera experience was a bucket-list item. I wanted to see a Chinese opera performance so that I could say that I did, and so that I would never have to see another. After this performance, though, I would like to go again. Hey, wife, want to go to the opera with me?